Our manufacturing plant and corporate office are located on a 29-acre site in Westville, Illinois. The production and pilot facilities are equipped with multiple glass-lined and stainless steel reactor systems ranging from 35 to 9000 gallons. Our extensive analytical capabilities include GC, HPLC, GPC, IC, FT-IR, full-development lab and pilot plant synthesis. As a result of a management purchase of CL Industries in 1993 the company changed its name to DynaChem. DynaChem is a privately held, medium-sized firm with key shareholders holding active management positions within the company. In March of 2007 DynaChem adopted an Employee Ownership Plan under ESOP. This plan allows all fulltime employees to own a share of the company. DynaChem's owner-management team combined with its Engineering, Technical, R&D, and Quality staffs are dedicated to providing our customers with the best possible solutions for their needs and requirements. DynaChem Incorporated has continued to expand in scope and capabilities since our inception in 1968. Through the 70's and the 80's under the Core-lube and CL Industries name the focus was mainly on products and services for the metal casting industry. Today DynaChem serves industry sectors such as; adhesives, agriculture, building materials, electronics, paper, paint and coatings, pharmaceuticals, reinforced composites, steel, textiles and many more. Our consistent growth has been achieved through strong customer partnerships and providing custom-formulated products through customer-specific solutions. DynaChem is truly a customer-driven company. We help our customers succeed by continually providing them with the products and services they need to compete today and in the future. When you select DynaChem Incorporated as your supplier or partner in chemical development and production you have selected the best partner. You will be working with people committed to providing the best. We are intensely focused on your specific requirements and responsive to your needs. Also, with our owner-management team you deal with decision makers that will provide prompt and focused efforts to your needs and requirements normally much faster than that of a larger organization. DynaChem Incorporated is built on a strong chemical and technical research foundation. Whether developing new products and processes or optimizing existing ones, our skilled staff of chemists and engineers have extensive experience and the ability to accomplish technical challenges. Research and pilot facilities are available on-site for taking products from lab quantities through scale-up and on to full-scale commercial production. Successful research most often comes from a succession of small and unheralded improvements that combine to keep our products on the cutting edge of available technology. In today's environmentally conscious climate, it is important to carefully consider the long-term implications of our actions for present and future generations. That is why DynaChem Incorporated takes great pride in rigorously adhering to all environmental regulations. The health and safety of all our employees, and of our community is our primary concern. HAZOP studies, risk assessment programs, employee training along with process design and control all help to ensure proper safety and environmental responsibility. At DynaChem quality is not only a program; it is the way we do business. Our mission is to respond to our customer's needs by producing high-quality, defect-free materials. Our Quality Assurance Laboratories are equipped with state-of- the-art analytical instrumentation ensuring timely and precise information. Quality systems are in place for every process in our operation, from receipt of raw materials to shipment of finished goods with ISO 9000 Certification. We recognize that the quality of the products and services we provide is an integral part of our customer's success. 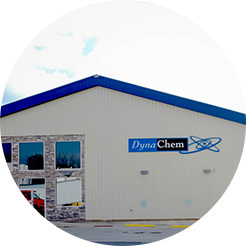 DynaChem's entire line of products is backed by more than 50 years of experience and research. You can depend on the technical expertise of our trained chemical sales force to help you select the proper chemical your process demands from our wide range of readily available products. We can also assist you with custom preparations to meet your precise specifications. You can depend on a reliable supply of material with fast delivery times that will make meeting deadlines simple.